This design was a special request for a family wedding and as it proved to be so popular we decided to make it available on the website. The Peacock design is instantly recognizable by its stunning array of shimmering iridescent plumage. In mythology the Peacock is associated with royalty, splendor, integrity and beauty. 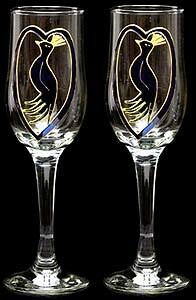 Our Peacock design is a perfect choice for that special celebration including anniversaries, civil partnerships and weddings. Price shown is for 2 glasses, boxed.